Fashion-style- words that have become a part of everyone’s life! No matter in which part of the world you are in, the world of apparel trends cannot be over looked. The Indian market too has been evolving at a great pace, fusion being the new definition of ethnicity and while there are fabulously innovative ensembles defining contemporary fashion, jeans with kurtis are one of the basic and most-loved outfits of the decade. Denims- basic straight-cut, skinny jeans, bell-bottoms, boyfriend jeans, ankle-cut, Capri length, shaded, faded, ripped- these bottoms are everywhere! It is a wardrobe staple that women today cannot do without. While there are a plethora of options in jeans, even kurtis come in amazingly huge number of variants. There are anarkali kurtis, A-line kurtis, floor-length kurtis; assortments are endless! 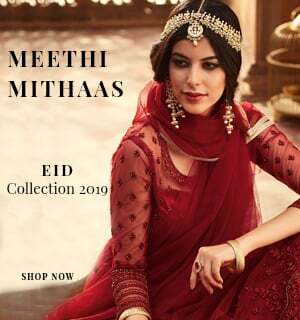 Some of these can be worn as single-piece ethnic Indian dresses while most of them are commonly paired with leggings, palazzos, skirts, denims, trousers, sharara or even dhoti pants. So you worked out hard at the gym to get that flat abs? It’s time to show them off! Front slit kurtis- long and usually flared towards the bottom are for lean and slender framed divas. These kurtis bridge the gap between boldness and gracefulness, with the front going high upto the waistline. Front slit kurtis look fabulous when made with light and flattering materials like georgette, chiffon and satin silk. Wear them with ripped denims or skinny jeans- this casually glam attire is apt for informal socializing. Basics and versatility make an eternal pair- you can practically combine any straight cut short kurti with jeans. Colorful cotton kurtis with simple jeans will take you through your workdays with comfort. Straight-cut embroidered kurtis in silk and georgette make smart party-wear options- fusion is the trending style statement after all! Short kurtis with denim bottoms carry a wide scope in styling- jacket layers, scarves, colorful footwear and quirky jewellery- there’s a lot you can work around with- be creative and step out in your energetic best. The Indian frock-style top or kedia, peplum kurtis are one of the coolest trends of this season. Quite a breather for the ones struggling with mid-riff flab, peplum kurtis carry a majestic feel- they are in fact a party outfit. For festivals, you can choose a colorful peplum kurti that has some dazzle like mirror work or maybe a good amount of sequins. Try them out with cigarette jeans if you’re skinny or with straight-cut jeans if you’re thicker on the lower side. Collared and buttoned-up kurtis are the most formal of all kurti styles. These shirt style kurtis go well with jeggings, simple straight-cut and even flared bottom jeans. Such ensembles make cool office-wear and college-wear options. You can even add a spunky touch for an outing with a quirky add-on, like a statement bag or funky slippers! Style tip: A front buttoned shirt kurti can be used as a jacket layer with jeans and crop-top. Let your heart wander- let go of all the rules, fashion is an innovative world so give in to its vastness! Uneven hemlines render a modish edge to even the simplest of kurti styles- you need nothing more. 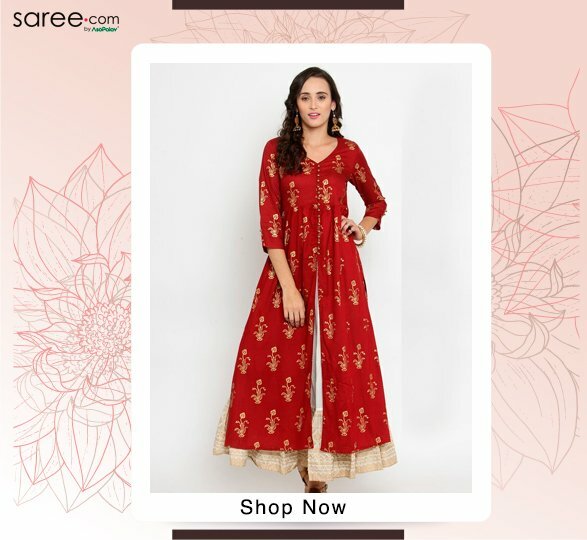 High-low kurtis or mid-length kurtis with wavy edges inherently carry more of a western appeal and for an ethno-contemporary look you can wear them with jeans. High-low cotton and cotton silk kurtis in pastel tones look chic when paired with light blue or white jeans- ideal for day outings. If you want to highlight the top, then the colour of the bottom should be contrasting and less striking- like navy blue jeans will highlight a mint green kurti and black jeans will go well with red kurtis. One good thing about denim bottoms is that you need not work upon much with the right shade- if you have a pair of light blue, dark blue and black jeans then you’re sorted! So these were the five types of kurtis that you must look out for to wear with a pair of denims. Innovate with add-ons and turn up unique- after all, you’re born to rule! 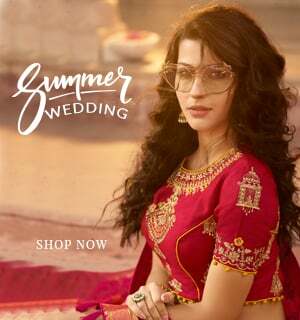 How to choose the best saree for your mom – for Mother’s Day?